Mealtimes are always special. It’s the time when every member of the family gathers at a place and enjoys together. Hence, your dining space should certainly be a cosy haven where the entire family can rejoice together. A neat, clutter free, decorated arena makes your dining moments even more pleasant. Here’s how you can notch up an inspiring dining arena with exotic decor. 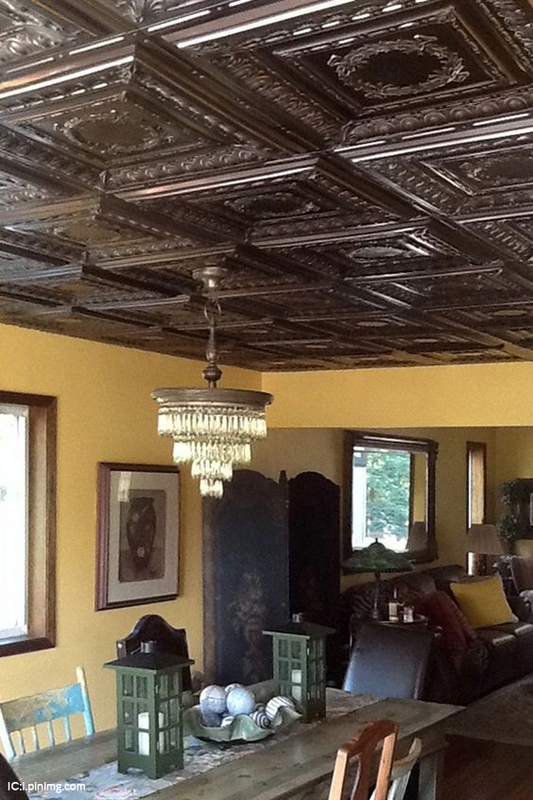 A stunning ceiling can jazz up the entire space. Opt for some architectural detailing or paint a unique design (you can try painting different shades across the ceiling for maximum effect) to accomplish the decor goal. If you are looking for an Old World-inspired ceiling, the custom rustic beams and artwork in muted primary hues would be the ideal option. An effective lighting can do the wonders. Hence, interior designers always focus on optimum lighting to bring out the best of the decor drama. 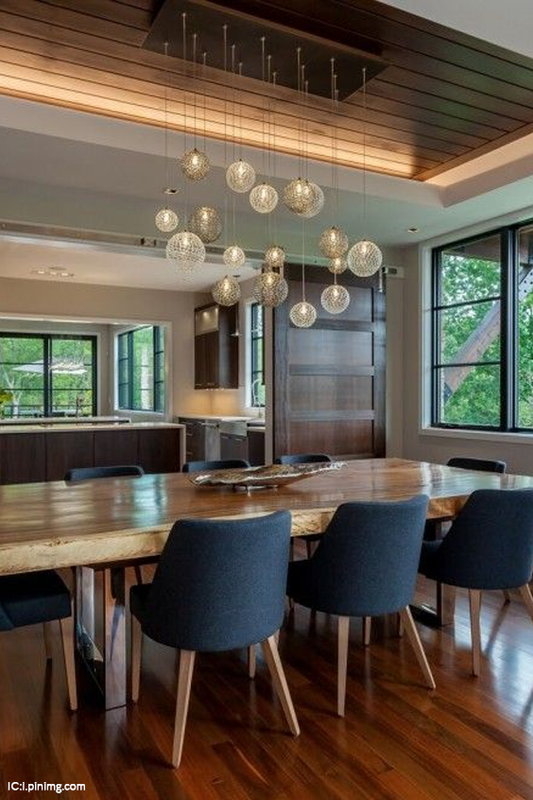 For a spectacular dining space, you can invest in eye-catching chandeliers and LED strips. Dress up this contemporary space with a glamorous chandelier. You can also perk up the artifacts with strip lights. 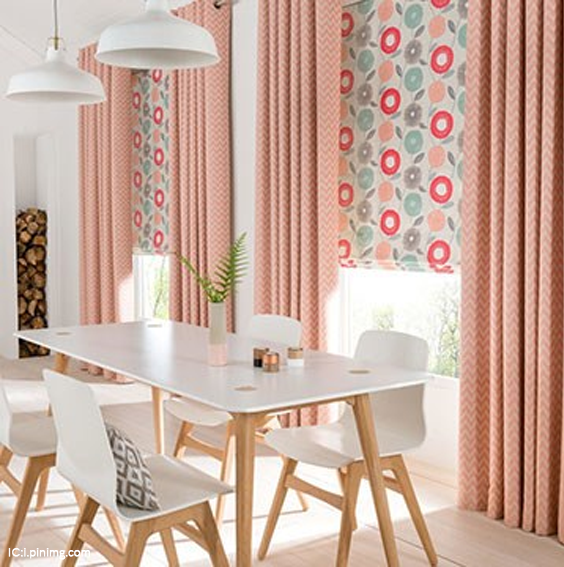 While a big dining table with appropriate lighting becomes the showstopper in most cases, curtains play a significant role in adding that extra pizzazz in your dining space. Opt for floral prints or sheer curtains for a creative flair in the space. Also, incorporate some playful window treatments to breathe life into the space. 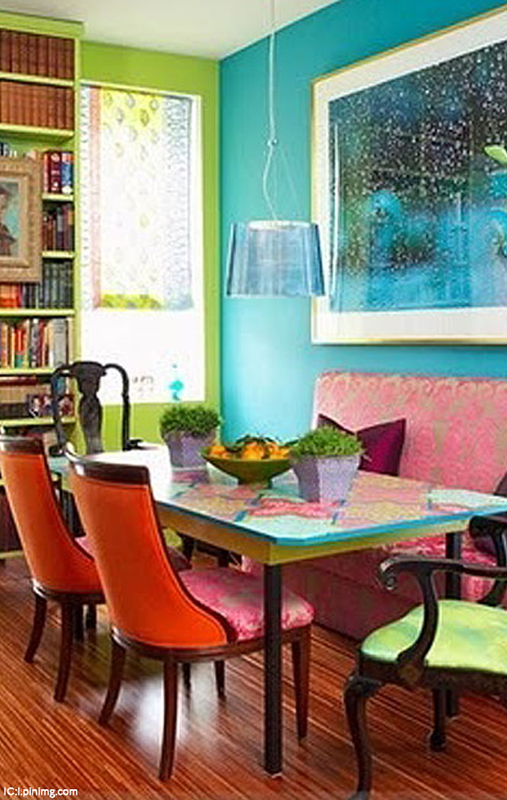 Vibrant hues are always a lure when it comes to interior decoration. According to Mrs. Pakhija, the proud owner of a 2 BHK apartment in Rajarhat, you can create a bold statement with eclectic seating arrangement in predominant colours such as pink and green. The bright, patterned draperies, contrasted with enameled walnut credenza celebrate the grace of the dining space while notching up the decor story. The entire dining space should give you a cosy impression. Dress the space to add elegance and warmth. An ornate area rug can serve you the ideal decor solution. You can also incorporate hand-painted wallpaper, floor-to-ceiling draperies and intricate China cabinet for an extra pizzazz. When it comes to a dining room decor, elegance should be your prime concern. Make sure that you are taking cues out of these ideas and craft out something really unique and pleasant. For many home makers, kitchen is a place where they spend a substantial amount of time preparing food and creating favorite moments for the entire family. After all the mealtime memories start from the kitchen; and, that’s absolutely a reason, why the gourmet space should be a place with proper ambiance that cuts your stress and at the same time encourages you to polish your culinary skills. Mrs. Sharma, the owner of a 3 BHK residential apartment near Salt lake Sector 5, believes that an appropriate decoration helps you enjoy a happy time in the kitchen. She shares some amazing ideas to spruce up every kitchen in the best way possible. Let’s check it out here. A perfect style for a 2 and 3 BHK, galley kitchen is all about making the appropriate space utilisation of the available space. Done within a narrow space, this kind of decoration involves a proper arrangement of the counters and all kitchen appliances on both walls. These are enclosed on all four sides that tend to make it dark and clumsy. But, you can light up and achieve a cheerful vibe by using pendant or track lights on the ceilings and below the storage shelves. You can get an elongated feel of the space by adding skylights. A great way to accentuate the kitchen space is to use light colour on it. Shelving is also a great way to make the space utilisation. It also helps in keeping kitchen accessories in place, by keeping the kitchen counter clutter-free. Kitchen islands make an apt choice for luxury apartment. The prime attraction of such design is the shelves that are designed to make the space look clutter-free. Another functional benefit of such kind of kitchen is to cook the meal and immediately serve, using the space as a dining area. While decorating your island kitchen, make use of dark wood or contrast colors of laminates on the table top to accentuate the design. To make more space for seating keep the chairs outside. Make more use of the overhead space to keep minimum appliances or accessories at the counter level. Set up channel drawers and cupboards to keep things clean, dry & organized. In many homes, U shaped kitchens are highly in vogue. However, a U-shaped design works well if you are having the dining area mingled with the kitchen. This can be really helpful as you will not have to carry the steaming dishes all the way from the kitchen to the dining area and then serve them. Make sure that the dining table and the kitchen countertops can be matched to keep sync. However, make sure to opt for light colours to amp up the space a bit. You can also buy hi-gloss units with glazed tiles to ensure a happy note in the kitchen. Stainless steel sink and countertops are also can help to perk up the brightness of the space. Do opt for wood finishes with dark shades of colors as they help in improving the graceful designs in kitchen and the dining area. The kitchen or the gourmet space should be designed so perfectly that it aptly reflects the elegance of your kitchen in every possible way. Put on a minimalist approach to make the most of your kitchen design. Keep in mind that every household story starts and ends with your very own “gourmet space”.